On Saturday, June 23 Modesto Sound will be hosting an event to showcase our newest project. The California Audio Roots Project is about making podcasts for people who choose to share their stories about their lives and living in California. The finished podcasts are available on our website to stream on our “Radio” page. We invite you to listen to them. On the 23rd, you can meet the producers and engineers, as well as the participants. Refreshments will be served, and there will be entertainment. This takes place from 2 p.m. – 4 p.m. at the main branch of Modesto Library on I Street. The event is in the basement auditorium. The project is funded by grants from The National Endowment of the Arts, The California Arts Council, The Mary Stuart Rogers Foundation, and The Bright Family Foundation. It is sponsored by The Friends of Modesto Library, Radio Stations 93.3 and 104.9, and The Peace Life Center. 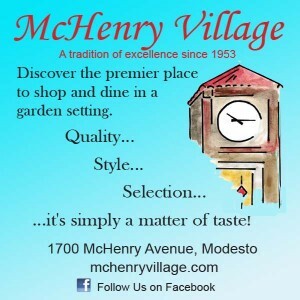 Come see and hear some of Modesto’s finest history. It is free and open to the public. 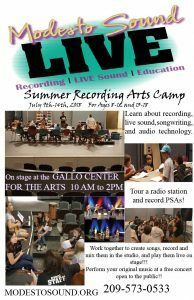 Summer means it’s time for camp… and Modesto Sound has a Recording Arts Music Camp that is awesome! It is held right on the stage in the Foster Theatre at Gallo Center for the Arts. Ages 8-18 get to learn about setting up a stage, how to write a song, record radio interviews, Public Service Announcements, and how to record music in a real recording studio, and then they perform their original songs right on stage at Gallo, complete with ushers who seat their family on performance day. Amazingly enough, campers also get to tour behind the scenes at Gallo and an I-Heart radio station. All this during camp week July 9-14 from 10 a.m. – 2 p.m. Cost is only $175 (actual cost per camper is $425). Scholarships to low-income families are made available this year by Boyett Make Dreams Real Foundation, with the stipulation that campers and their family give back to the community through public service such as helping the non-profit Modesto Sound with marketing, participating on park cleanup day, etc. For campers who participate in such public service opportunities, camp tuition is free. What a great opportunity for kids that may not be able to afford a camp this summer!! This class will be held on Tuesdays and Thursdays starting on July 17 from 5:30 p.m. – 8:30 p.m. It lasts for seven weeks. The cost is only $200 per person (The true cost to run the program is $500 per person. Fortunately the program is subsidized by a grant from the US Bank Foundation to make it affordable to all families.). 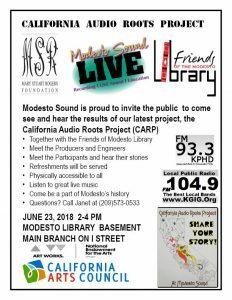 To find out more about any of these summer activities email Janet Seay, Executive Director of Modesto Sound, at janet@modestosound.org or call her at 209-573-0533.